Google Reader is soon going to shutdown, and thus you would be already looking out for the best options, but why search when one of the options is directly available in your OS already – Microsoft Outlook. An option is easily available from Google to extract all the subscriptions from the Google Reader but to add them to the Microsoft Lookout account is something else. Microsoft Outlook would do the same job of updating the feeds with the newest content, and that is what would serve similarly to the Google Reader, although some alternatives like Feedly are way better. As we had earlier explained in a tutorial, Google has provided an easy way of exporting all the subscriptions and data from your Google reader account through Google Takeout service. Check out the Tutorial to learn how to take out all the data and that would be extracted in the OPML file format. Open Microsoft Outlook, and in the left panel right click on “RSS Feeds” to see the list of available options for the RSS feeds in the Outlook. Click on “Import an OPML file”. In the next window, click on Browse and then browse to the folder where you have downloaded the data through the Google Takeout, and finally select the subscriptions file, which would be an OPML file. 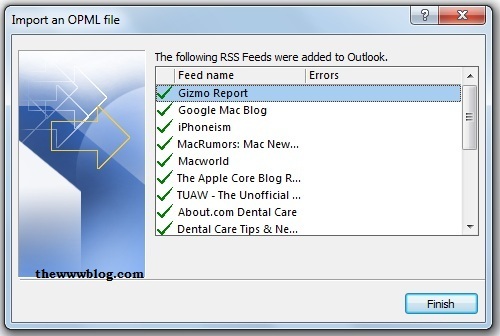 Once the file is selected, the MS Outlook would list all the RSS Feeds and give you the options to select the feeds which you want to add to the Outlook. Select one by one or select all at once and click on Next. Once the transfer of feeds is done, it would show the list with the errors if any. 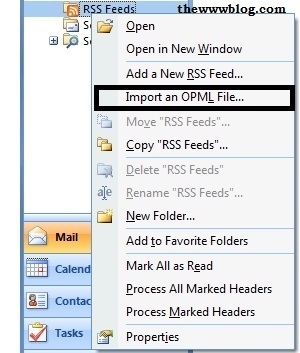 Click on Finish and you would see the entire list of RSS Feeds under the same menu in the Outlook. This is a pretty easy tutorial, but one has to do the steps properly as given in the link above, while extracting all the feeds and subscriptions from their Google Reader account, through the Google Takeout service. 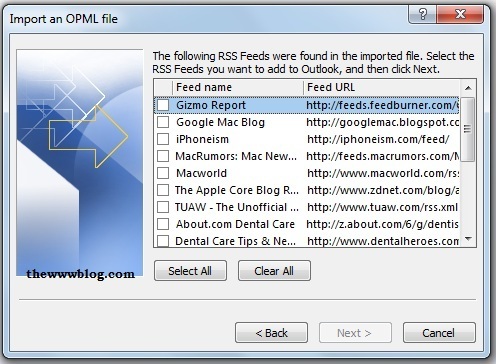 Though if you are trying to check for something better than Outlook, there are several Feed clients for both Windows and Mac OS, and one of the best recommended from us is Feedly which does a good integration of itself in the web browser, and it has the option of transferring your feeds from Google Reader to Feedly in the easiest way.